We offer quality range of Bucket Elevators to our clients used for carrying the products to machine hopper. These are synchronized with the basic/main machine.These offer superior performance without any breakdown for long periods. 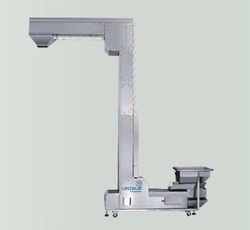 UNIQUE PACKAGING SYSTEMS offer quality range of Industrial Bucket Elevators, used for carrying the products to machine hopper. These are synchronized with the basic/main machine. The motor with these machines are of 2 hp, 220v, ac. These offer superior performance without any breakdown for long periods. Elevator controlled by automatic level control system.